The Federal High Court, Abuja, has asked former Peoples Democratic Party ( PDP ) spokesman, Mr Olisah Metuh, to be present at his trial on Feb. 5 or face jail. Justice Okon Abang gave the order on Thursday, when he delivered ruling in an application filed by Metuh, seeking an adjournment to his trial on health grounds. The judge said that the letter which Metuh wanted the court to rely on to grant the adjournment was not a proper document before the court. “I agree with the prosecution that the purported letter written by Dr O.C. Ekweogwu, who is unknown to the court, is trash and a useless paper meant for the dustbin, which was dumped on the court by the defence. The judge said that there was a laid down procedure for filing a medical report in court. He said it was not the place of a medical practitioner to write a lengthy letter with several medical terms that were meaningless to the court. The judge further said that although the application by the prosecution to revoke Metuh’s bail and commit him to prison deserved to succeed, he would not grant it based on compassionate grounds. “It is my humble view that the application of the prosecution to revoke the defendant’s bail deserves to succeed, but I have given due consideration to the arguments of counsel to the defendant. The judge, however, said that if Metuh failed to appear in court on the next adjourned date, he would revoke the bail. “Arrest is a consequential order if bail is revoked, and so if the defendant’s bail is revoked, he will be arrested. 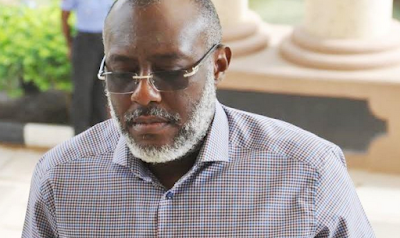 The court said that it was not inclined to try Metuh in absentia, as it was contrary to Section 266 of the Administration of Criminal Justice Act, 2015. The judge also said that he would no longer accept any medical report with respect to Metuh, issued by a doctor in Nigeria. He further granted the application by the defendant’s counsel to bring seven additional witnesses, saying he will not accept any application for more witnesses. He adjourned the matter until Feb. 5 and 6 for continuation of trial. Metuh’s trial was to resume on Monday but he was absent in court. When the matter was called, Mr Onyeachi Ikpeazu (SAN), counsel to Metuh informed the court that his client was admitted at the Nnamdi Azikiwe University Teaching Hospital, Nnewi, and was unable to attend court. Ikpeazu presented a letter written by a doctor in the hospital to the court, but both the judge and the prosecutor questioned the authenticity of the letter. The prosecutor went further to ask the court to revoke Metuh’s bail for breaching his bail conditions and commit him to prison. Metuh is standing trial over allegations of receiving N400 million from the former National Security Adviser, retired Col. Sambo Dasuki and also money laundering charges involving $2bn.